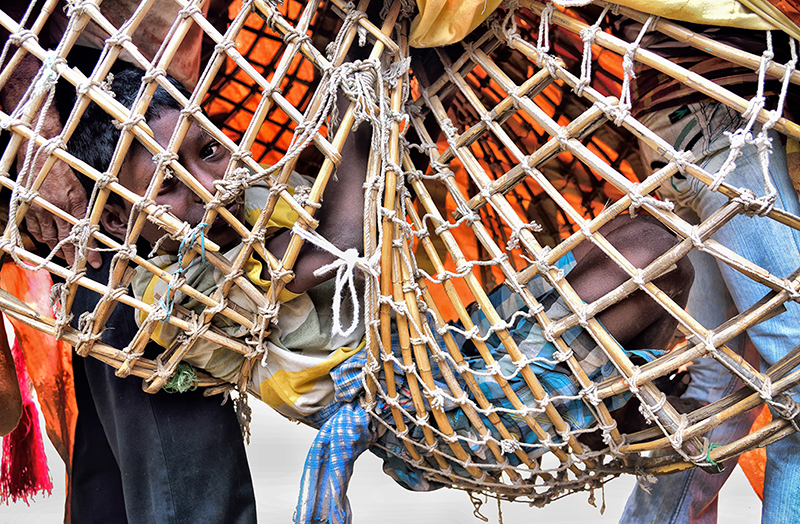 Traditions, festivals and rituals play a significant role in the conventional way of life in rural Odisha; one of the most culturally diversified states of India. 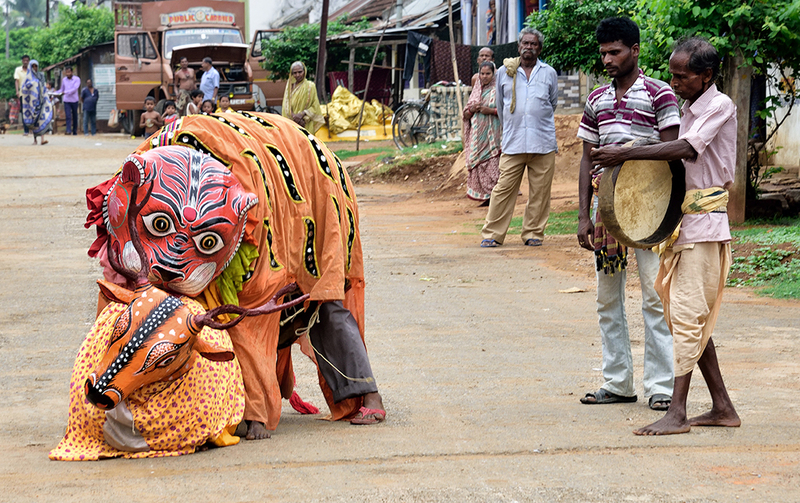 Tiger mask dance is a popular and highly regarded unique folk dance form in Odisha. It is widely practiced in Bhanjanagar sub-division of Ganjam district, Odisha. Apart from Tiger, the Bull, Deer and Horse dance are also typical features of this region. This fast and dynamic dance needs enthusiasm and energy not only for the dancers but also for the drummers and bell players. Acrobatic movements and hissing sound charm, captivate and excite the audience especially children. Although visibly it seems simple but it needs skills, energy, coordinated staging and skilled direction. 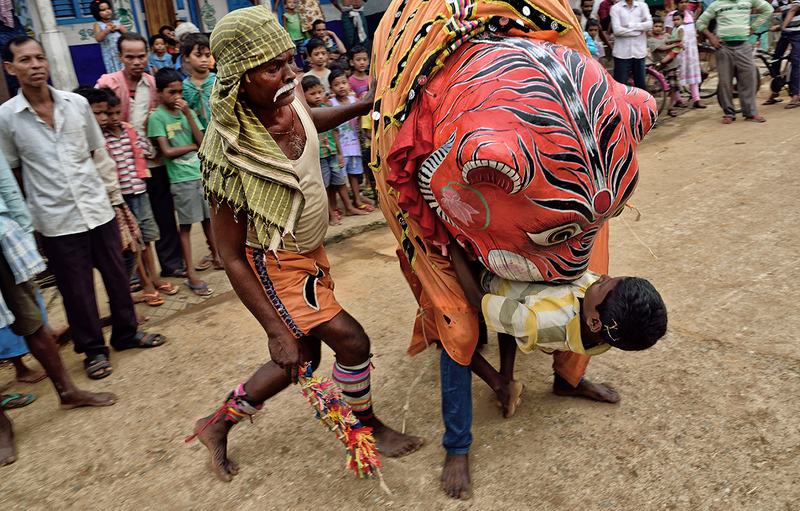 The Tiger dance is performed by two dancers in coordination who get into a cane frame concealed by thick cloth richly decorated with applique work and mirrors. 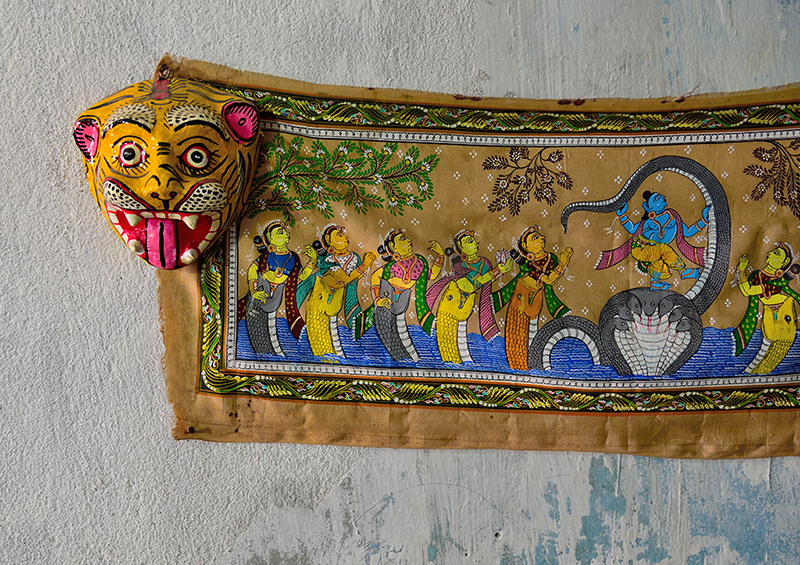 The masks are bigger than the head with colourful traditional paintings and decorations. The masks are made of paper-pulp, cow dung and wood. 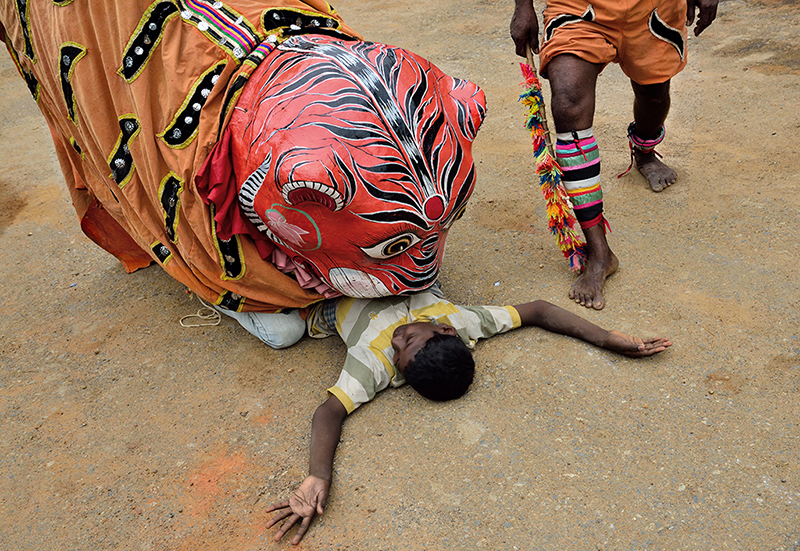 The legs are visible and have ankles tied to it and form the legs of the tiger. Experts smear the whole body with yellow varnish, black spots and stripes; their costume contains a tiger’s mask and tail made of cloth. The dancers take part in religious procession especially “Takuraniyatra”, “Ramnabamiyatra”, “Dolyatra” and other ceremonies where they dance to the rhythm of “Changu” played by traditional drummers. Apart from the festivals it’s also performed in bridegroom’s procession or some rural private parties. 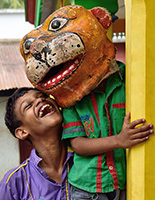 The tiger mask is famous and readily available; children love to play with this mask. I was lucky enough to get a chance of interaction with Budhia Gouda, who is 55 years old and leader of a local animal mask dance group of Bhangnagar district. 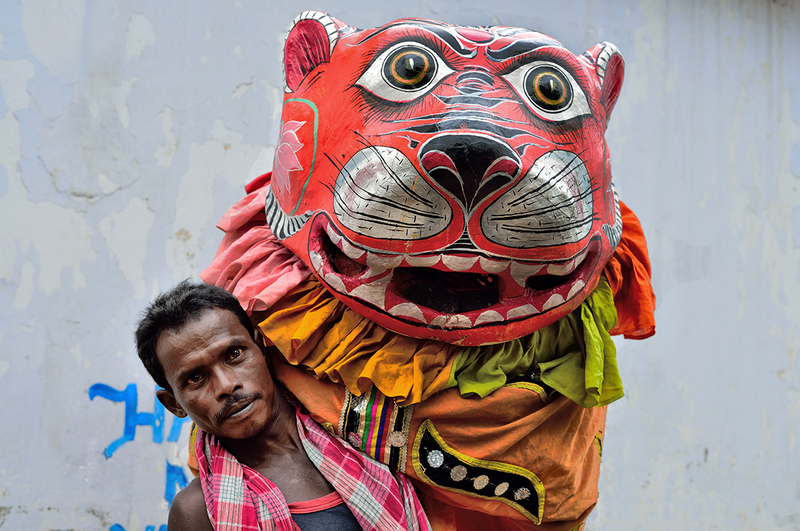 His main occupation is cultivation and his passion of Tiger dance makes him popular and recognised in the region. Since childhood he is fascinated by this dance form and he started his training when he was 20 years old; after 35 years of practice and performance he is now a proud leader and trainer who transfers this art form to younger generation. But unfortunately earning from this art form is too meagre and inconsistent; therefore younger generations are not interested to learn this art. 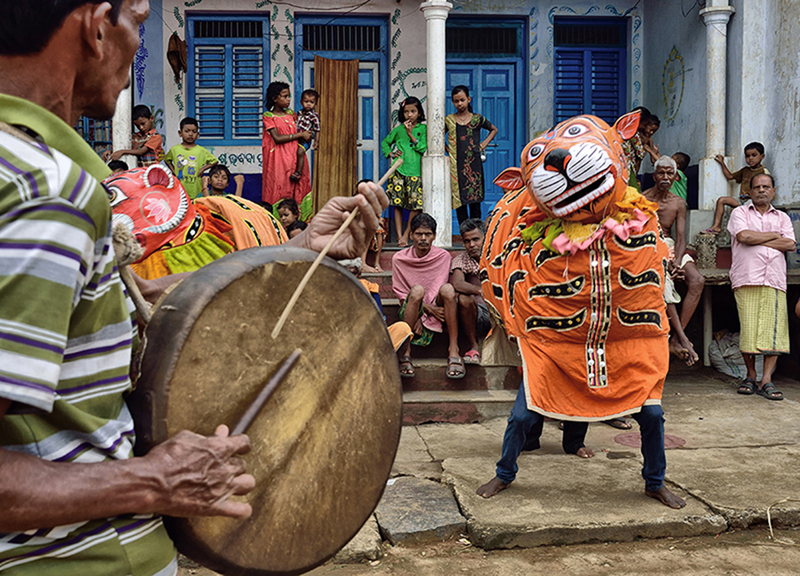 Budhia Gouda believes that Government support and encouragement is necessary to sustain this local art form of Tiger dance.